Cranbrook is predominantly a Grain-Sheep or Grain-Beef Cattle Farming area. Nestled in the Great Southern region of Western Australia. With a blend of productive farmlands, picturesque scenery and an ideal lifestyle, the Shire is as diverse in its businesses and activities as it is in its landscapes. 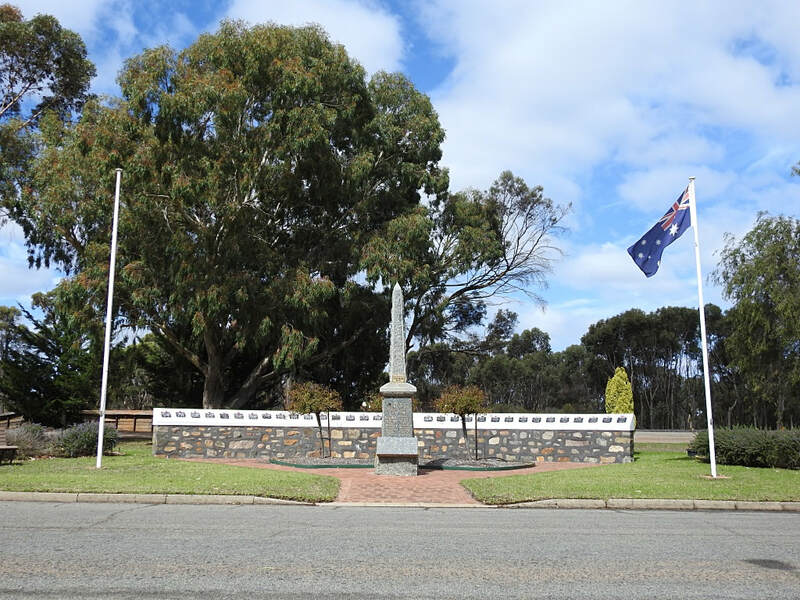 The War Memorial at Cranbrook was originally erected to the fallen soldiers of World War One. Funds were being collected as early as June 1922 for the erection of the memorial. 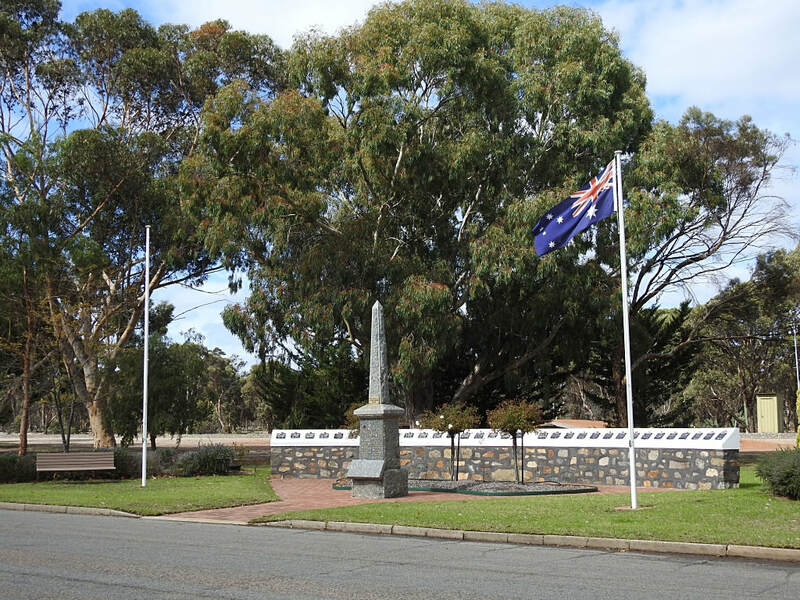 On 30th July 1922, an avenue of honour of sugar gums was planted in nearby Frederick Square to commemorate the 18 fallen of World War One. 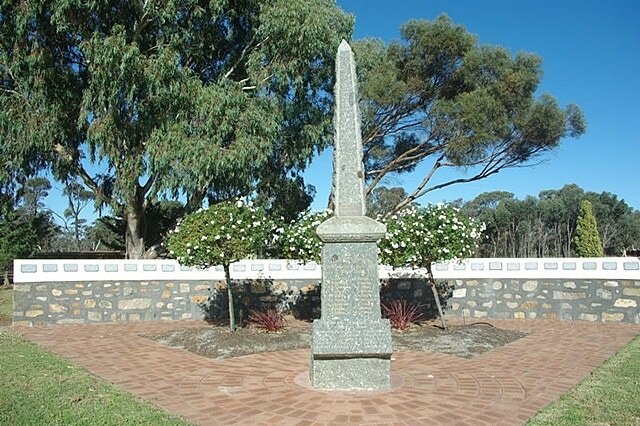 At the time of the planting, space had been allocated for the erection of the memorial obelisk. 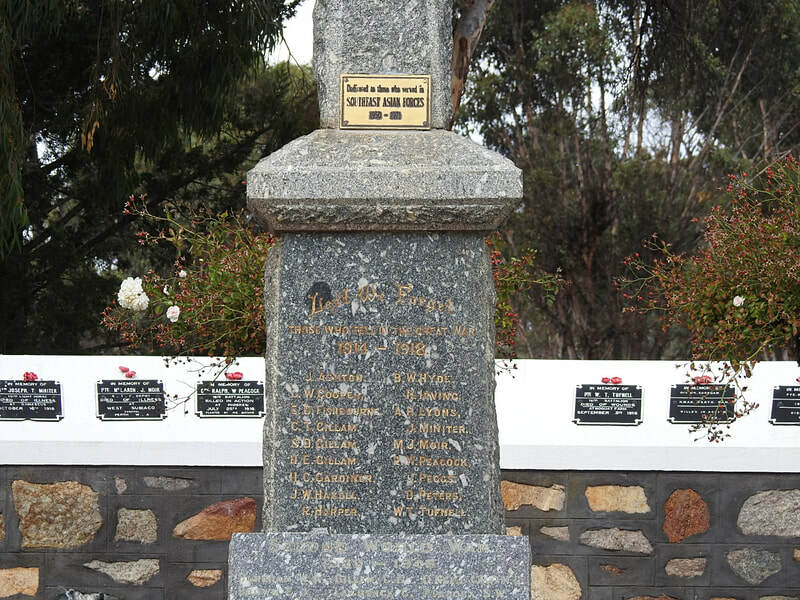 The stone of Albany grey granite had been ordered and it was to be engraved with the names of the 18 fallen soldiers in whose honour the avenue had been planted. 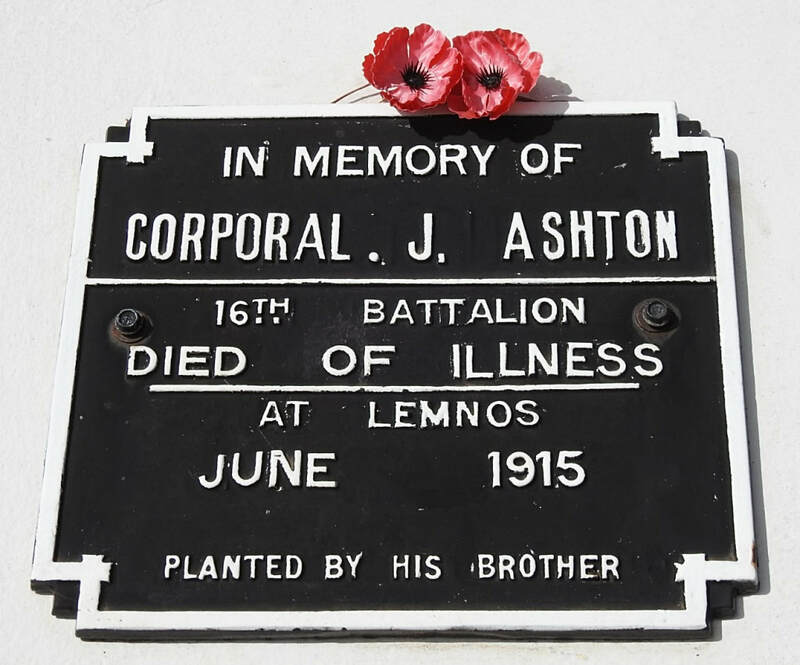 568 Lance Corporal John Ashton, 16th Bn. Australian Infantry A. I. F. Died 8th December 1918, aged 24. Son of Thomas William and Isabella Ashton, of Ashtonville, Cranbrook, Western Australia. 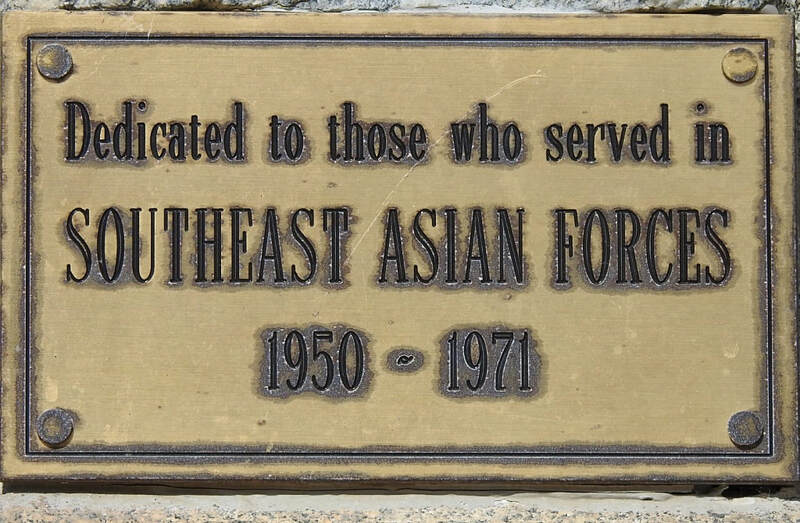 Born at Hill End, New South Wales. Buried in Portianos Military Cemetery in Greece. 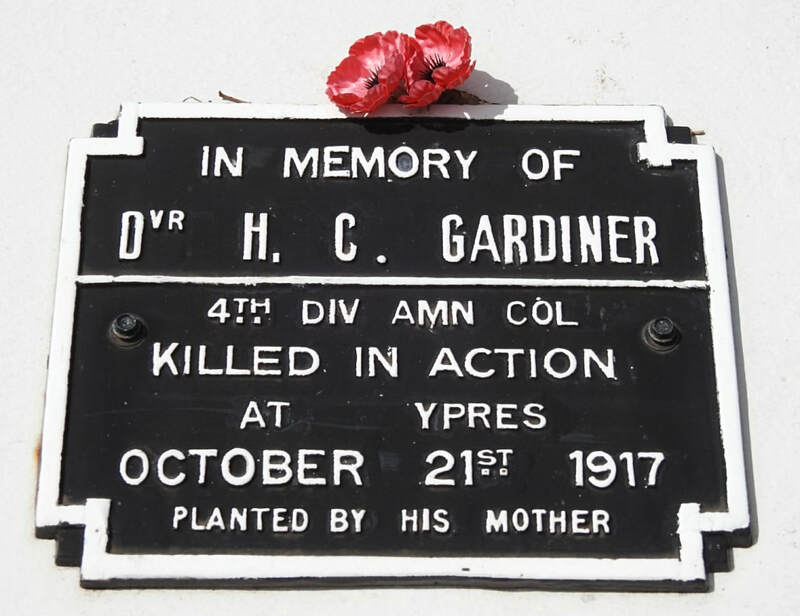 1575 Driver Henry Charles Gardiner, 4th Div. Ammunition Col. Australian Field Artillery, died 21st October 1917, aged 21. Son of Alfred Charles and Mary Gardiner, of Cranbrook, Western Australia. ​Buried in Belgian Battery Corner Cemetery in Belgium. 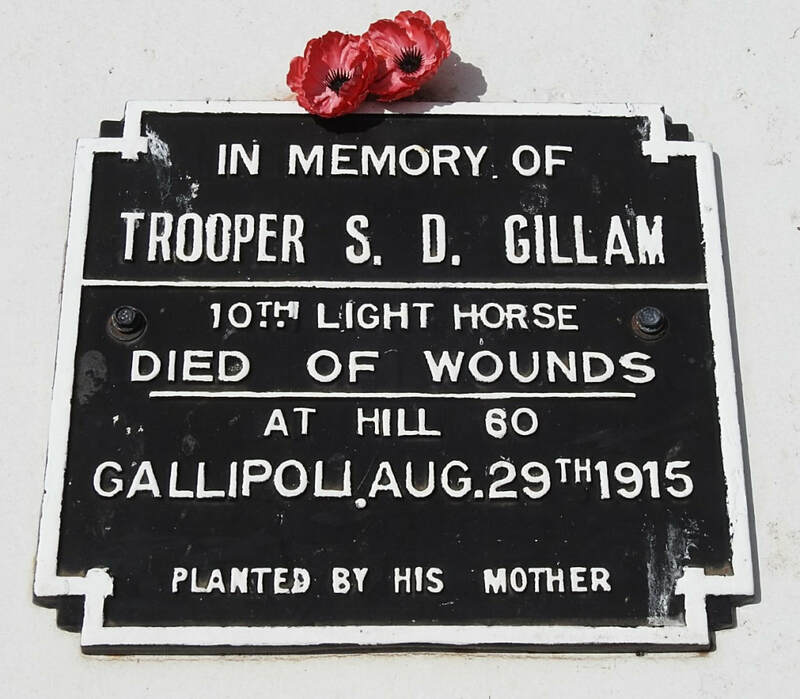 INSCRIPTION "Though lost to sight to memory ever dear"
618 Trooper Sydney Davenport Gillam, 10th Australian Light Horse, died 29th August 1915, aged 29. Son of John Pretivus Gillam and Florence Sarah Gillam. Native of Tenterden, Western Australia. Commemorated on the Lone Pine Memorial in Turkey (Gallipoli). 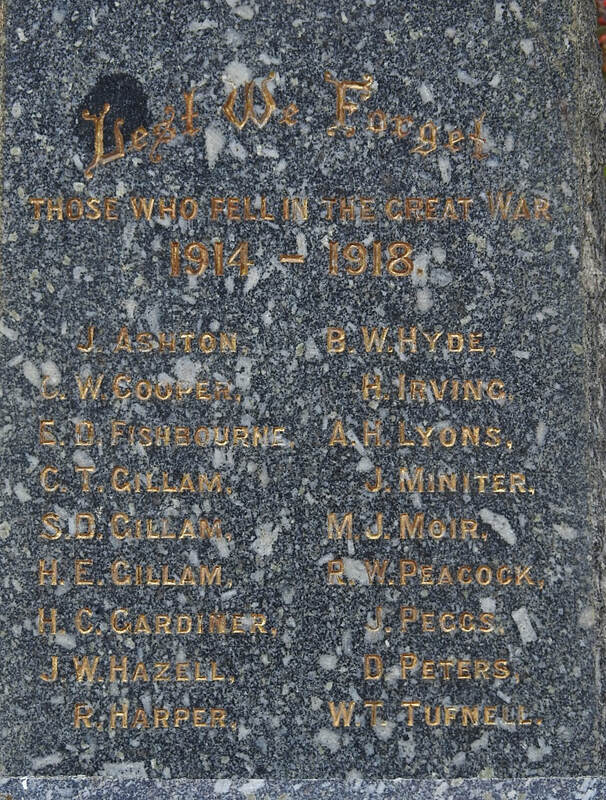 His brother Hubert Evelyn Gillam also fell and is commemorated on the same memorial. 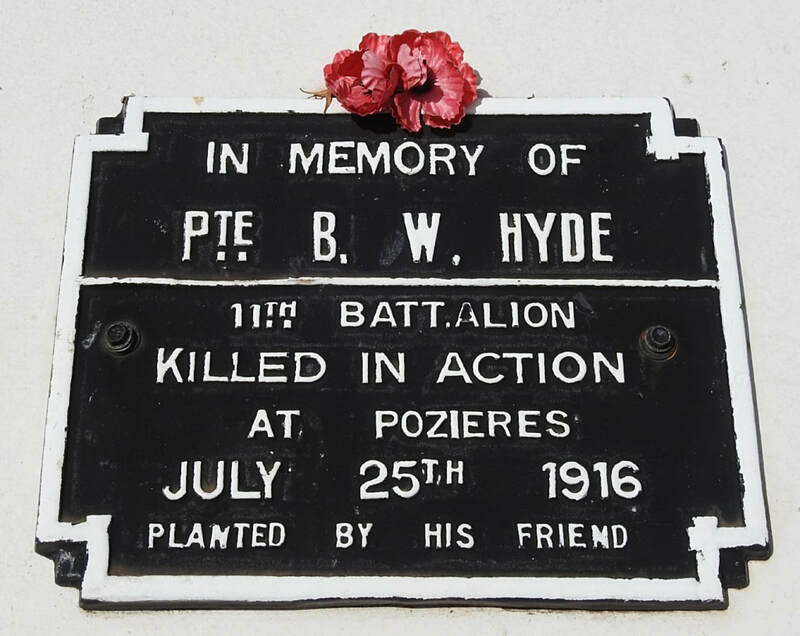 3832 Private Benjamin Watts Hyde, 11th Bn. Australian Infantry, A. I. F. Died between 22nd July 1916 and 25th July 1916, aged 42. Son of Benjamin and Sarah Hyde; husband of Emily Hyde, of Hillside Cottage, Amberley, Stroud, Glos, England. Born at Yeovil, Somerset, England. Commemorated on the Villers-Bretonneux Memorial in France. 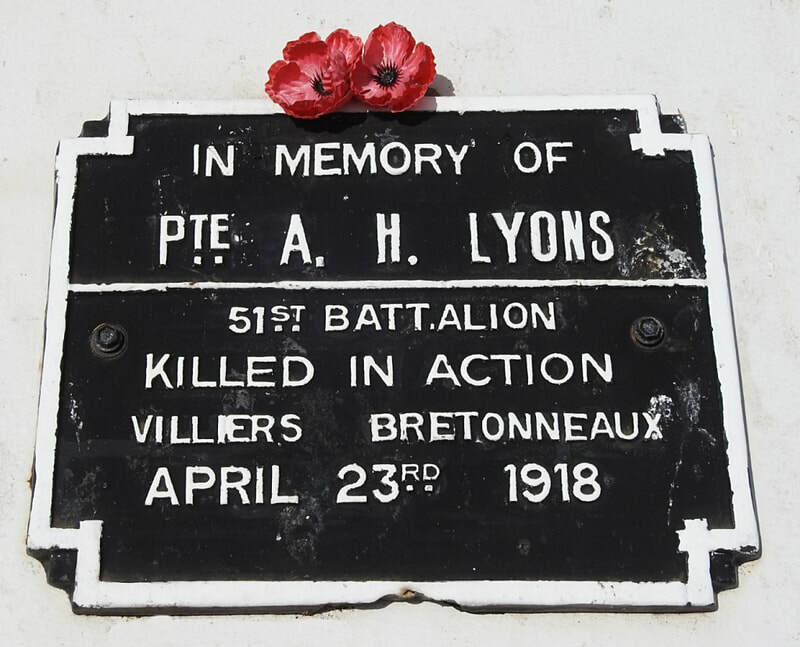 8014 Private Arthur Hugh Lyons, 51st Bn. 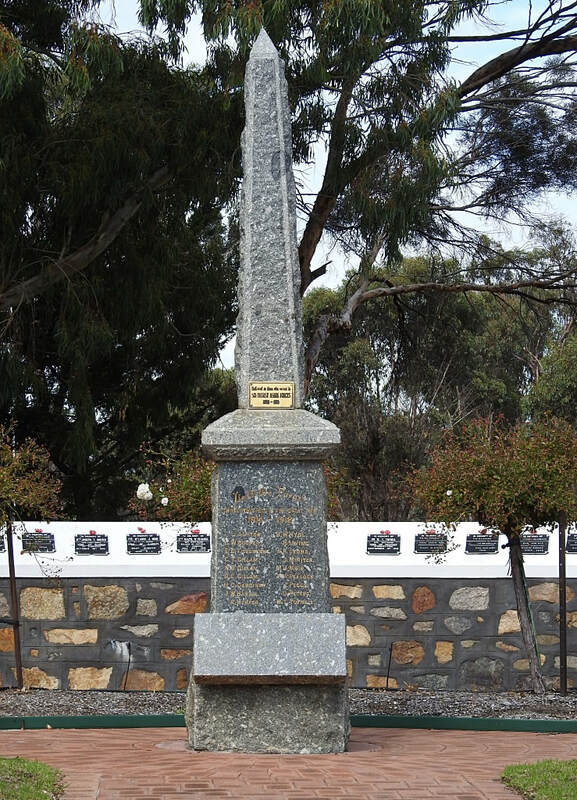 Australian Infantry, A. I. F. Died 24th April 1918. Son of Henry and Jane Warren Lyons; husband of Hilda M. Lyons, of The Post Office, Albany, Western Australia. Born at Sligo, Ireland.